The DAP Logo is a signature for products immediately recognized for their quality and leadership. It is a powerful signal to generations of do-it-yourselfers and professional tradespeople who chose and use DAP products with the utmost confidence. This awareness, acceptance, purchase preference, and overall user satisfaction for DAP products is anchored by our family of America's Number 1 Selling products which are powerful market leaders. 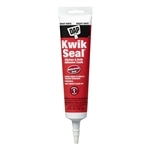 DAP Kwik Seal Bonds like a glue and seals like a caulk. Always In stock at Pearson Distributing. Kwik Seal provides a durable, watertight seal. Excellent adhesion and flexibility. Tools easily. Cured caulk is mildew resistant. Paintable. Easy water clean-up.